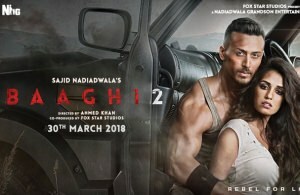 BAAGHI 2 is the story of a fearless rebel who undertakes a dangerous mission when his ex-girlfriend seeks his help. Ranveer Pratap Singh (Tiger Shroff) is a brave army officer. One day he gets a call from his ex-girlfriend Neha (Disha Patani). She asks for his help in finding her daughter Rhea who got kidnapped two months ago. Ranveer begins his investigation but hits a dead-end soon enough. Nobody is a witness to the kidnapping. Some even claim that Neha never had a daughter. Neha’s husband Shekhar (Darshan Kumaar) also confirms this fact. He adds that Neha is suffering from posttraumatic stress disorder due to which she is imagining her daughter getting kidnapped. Ronnie confronts Neha over this revelation but she remains adamant. Ronnie refuses to believe, prompting Neha to take a shocking step, which devastates Ronnie. What happens next forms the rest of the film.